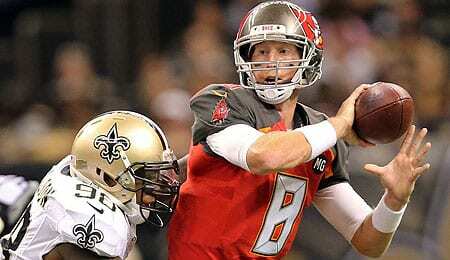 Mike Glennon, Chicago Bears: Glennon is easily the most intriguing name to switch teams at this point. His career numbers, compiled over 18-plus games, are respectable: 4,100 yards, 30 touchdowns, 15 interceptions. Glennon has good size (6’7″) and has shown he can push the ball downfield. Conversely, he basically hasn’t played since 2014, doesn’t put a lot of zip on his passes and has accuracy issues. Plus, Chicago’s receiving corps just lost its best player in Alshon Jeffery, leaving injury-prone Kevin White and Cameron Meredith to hold things down on the outside. Consider Glennon a late-round flier as a QB3. And hey, if quarterbacking the Bears doesn’t work out, at least he has a fall back option as a singer (see video below). Brian Hoyer, San Francisco 49ers: Hoyer is that guy teams will always be looking to upgrade on, which is why he’ll be suiting up for his fourth club in as many years. He was efficient with the Bears last season and downright effective at times for the Texans in 2015, but on a team as bereft of talent as the 49ers, there’s little appeal to Hoyer even if he proves to be a season-long stopgap for whatever passer they pluck out of the draft. Brock Osweiler, Cleveland Browns: Go ahead and affix as asterisk to Osweiler, as the speculation is that he’ll never suit up after being dealt from the Texans earlier in the offseason. To put it mildly, Osweiler didn’t live up to expectations upon inking a massive free-agent deal with Houston last offseason, completing less than 60 per cent of his passes and tossing 16 picks against only 15 touchdowns. Still just 26 and with some solid film from his time in Denver, Osweiler will get another chance somewhere. It’s tempting to write him off, but that’d be a bit hasty. Keep an eye on him and see where he lands and what role he’s penciled in for. Jay Cutler, UFA: By any tangible metric, Cutler is superior to Glennon, the man the Bears signed to take his place under centre. Cutler’s relationship with the fan base had become toxic, however, and right or wrong he was the focal point of their frustrations. He also made the playoffs once in eight seasons with the Bears, so it’s easy to see why it was time for a change. As with the others in this section, it’s impossible to fully project value until he signs (unlikely to happen before the draft at this point), but it certainly seems that former Bears OC (and current Dolphins coach) Adam Gase uncovered the best way to employ Cutler in 2015 as a pseudo game manager. It’s hard to envision Cutler landing somewhere that would give him appreciable Fantasy value, although Houston could be an interesting destination. Colin Kaepernick, UFA: In 2013, when the 49ers were the defending NFC champions and Kaepernick was considered the newly minted “prototype” for the NFL’s QB of the future, he threw for 3,197 yards, 21 touchdowns and eight interceptions while completing 58.4 per cent of his passes and adding 524 yards on 92 carries (5.7 YPC). Last year, Kaepernick’s prorated stats (from his 11 starts to 16 games) were: 3,260 passing yards, 23 touchdowns, six interceptions on 59.2 per cent completions with 100 carries for 680 yards (6.8 YPC). Not much different. Of course, Kaepernick garnered tons of headlines for his pre-game protest, and there’s little doubt that this, combined with uncertainty about his ability to actually register Ws post-Jim Harbaugh, is why he still finds himself unemployed. In the right scenario Kaepernick could be an interesting flier as a dual threat, but he’d need to land somewhere that starting is a realistic outcome. Robert Griffin III, UFA: Griffin has now made 12 starts in the last three years combined, and it’s telling in a league starving for good quarterback play that nobody has seen fit to roll the dice on RG3. That’ll change, of course, and he’ll probably end up in some 1A/1B situation with another fringe option… kinda like last year. Steer clear. Ryan Fitzpatrick, UFA: Note to teams and players: contract stalemates end badly. The Jets tried to re-sign Fitzpatrick on the (relatively) cheap last year, while Beardy tried to parlay the best season of his journeyman career into a huge payday. Fast-forward a year, Fitz is a free agent again and the Jets are trying to figure out who’ll play quarterback for them in 2017. Odds are Fitzpatrick lands in a mentor role as a capable backup. Tony Romo: Jerry Jones finally set Romo free, and the 37-year-old immediately signed on to replace Phil Simms in the broadcast booth at CBS. End of story, right? Wellllllll… maybe. The story about Romo now becoming “every team’s emergency backup” rings true, especially if that team was a legitimate contender. Don’t draft him, of course, but don’t forget about him, either. Now it’s your turn. Let us know in the comments below which quarterback in a new situation you’re targeting. You might have caught an occasional news blip, oh, roughly every 30 seconds or so, about the supposed friction between Bronco head coach Josh McDaniels and starting quarterback Cutler.